Since its release, our flagship OPPO BDP-105AU has been the reference for audiovisual enthusiasts. Known for its audiophile-grade sound fidelity, the BDP-105AU is revered for its moving performances not just in the home theatre, but as a hi-fi component as well. Now modified with the Darbee Visual Processor, this player’s picture quality is given a new level of depth, sharpness and realism. It’s also compatible with DSD and PCM, the latest and greatest high resolution audio formats, for the best sonic experience when paired with the in-built SABRE32 DAC. The DAC is one of the most important components for digital audio playback. The SABRE32 Reference ES9018 from ESS Technology is the world’s best performing 32-bit audio DAC solution targeted for high-end consumer applications and professional studio equipment. With the ESS patented 32-bit Hyperstream™ DAC architecture and Time Domain Jitter Eliminator, the SABRE32 Reference DAC delivers an unprecedented DNR (Dynamic Range) of up to 135dB and THD+N (Total Harmonic Distortion plus Noise) of -120dB, the industry’s highest performance level that will satisfy even the most demanding audio enthusiast. The BDP-105D uses two ES9018 DAC chips – one for the 7.1-channel output, and another for the dedicated stereo output. To learn more about the technologies behind the exceptional performance of the SABRE DAC, please read the SABRE Technical White Paper. The BDP-105D features a dedicated 2-channel analogue output with specially optimized ES9018 DAC and output driving stages. 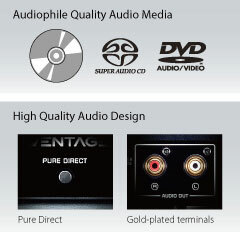 The stereo output offers both XLR balanced and RCA single-ended connectors. The balanced output features a true differential signal path all the way from the DAC to the 3-pin XLR connector. By transmitting a pair of differential signals, the balanced output provides better common-mode noise rejection and improves signal quality. USB Asynchronous DAC By bypassing the low fidelity, poor quality DAC of traditional computer soundcards, the BDP-105D turns any computer into a high performing multi-media source by converting digital audio to analogue through the ESS Sabre32 Reference DAC. The BDP-105D supports DSD audio in standard rate (DSD64) or double rate (DSD128 or DSD 2x) via its new USB DAC input. If your computer can play it, the BDP-105D can convert it to analogue. A toroidal power transformer offers superior power efficiency and much lower exterior magnetic fields over traditional laminated steel core transformers. The BDP-105D’s toroidal linear power supply provides a very clean and robust power source to the critical audio components. For a more intimate listening experience, a pair of headphones can be connected directly to the BDP-105D’s built-in headphone amplifiers. The headphone amplifier is connected directly to the ESS Sabre32Reference DAC and offers a unique performance advantage over standalone headphone amplifiers. “It’s like lifting a veil.” Darbee’s Visual Presence™ technology establishes a fundamental breakthrough for image realism. By embedding stereoscopic depth information generated from a patented human-vision-based model into 2D or 3D video, it provides greater clarity and increases the perception of depth resulting in a more dynamic, lifelike experience. The amount of processing is adjustable, allowing you to customize the visual enhancement to your particular taste. More information about Darbee’s Visual Presence™ technology can be found here. This Blu-ray Disc Player is compatible with Miracast™, a wireless standard that lets you connect any Miracast™-compatible smartphone or tablet for mirroring videos and photos to the player, so the whole family can view them on a widescreen TV. When using a Yamaha AV receiver, you’ll enjoy a variety of media mirrored via Miracast™ with dynamic sound. The next generation of player designed for the arrival of UHD resolution. Enjoy apps built for TV, stream your favourite content and upscale everything you watch. The best player for all your HD content and much, much more . . . 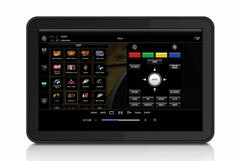 The BD-S677 Universal Player delivers enhanced connectivity and functionality including intuitive app control, YouTube Leanback and Dropbox compatibility for accessing media stored online. Access all your video content with Miracast™ from compatible smartphones and tablets, and video streaming from DLNA network sources. The BD-S677 is the ultimate companion for the ’77 Series AV Receiver.